A key aspect of planning a virtualization environment--for example, one based on Windows Server Hyper-V, with or without System Center Virtual Machine Manager--is designing the fabric, an umbrella term that includes the physical servers, switches, cards, connections and other infrastructure hardware that allows storage resources to be accessed by hosts and by the virtual machines running on these hosts. Storage is fundamental to any virtualization environment and can take different forms ranging from block-level storage solutions like Fibre Channel or iSCSI SANs to local or network file-based storage solutions. Each of these different types of storage can be a valid choice in different virtualization scenarios depending on your budget room and the degree of reliability, availability and workload performance you need in your environment. These two books consist of recommendations and tips contributed by Hyper-V experts working at Microsoft and they can also be helpful when planning the storage fabric for your virtualization environment. Now let's proceed by discussing some considerations when contemplating the use of solid state drives (SSDs) for storage on Hyper-V hosts. SSDs may use either single-level cell (SLC) or multi-level cell (MLC) flash technologies, and enterprise SSDs generally use eMLC (enterprise MLC) which enhances MLC with wear-levelling, deduplication, redundancy and write optimization technologies. A good explanation of the differences between these various technologies can be found in the article MLC vs SLC: Which flash SSD is right for you? Although SAS SSDs have a long endurance cycle, there are some scenarios where you may want to use enterprise hard disk drives (HDDs) instead. That's because the total write lifetime of an SSD is basically finite even when advanced write-optimization and wear-levelling algorithms are factored. By contrast, the write lifetime of an HDD is limited mainly by the mechanical failure of the bearings. D: on a HDD RAID 10 volume to host the database, application code, transaction logs, and so on. But if your virtual machine is running applications or services that are not write-intensive, such as a DHCP server or DNS server, then you could host the guest operating system and application or service on a single volume on a SAS SSD. Using SSDs can drastically boost the performance of applications and services running in virtual machines on Hyper-V hosts. And the price of enterprise SSDs continues to drop as their capacity, reliability and write lifetime steadily increase. As a result you might opt to use SAS SSDs even for running your write-intensive applications such as SQL Server databases with the idea that although your SSDs might wear out in 18-24 months of almost continuous use, by the time you need to replace them the price of an equivalent SSD will likely have significantly dropped to the point that the long term amortization of the cost of running your database application makes SSDs more affordable than HDDs over the long term. 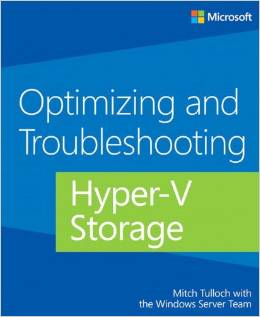 So far we've been focusing on using SSDs for local storage or direct attached storage (DAS) on Hyper-V hosts to boost operating systems and application performance and responsiveness. But SSDs can also be used for network storage for Hyper-V hosts, and a good example would be using Storage Spaces on a Scale-out File Server (SoFS) to create pools of storage that combine SSDs and HDDs, with or without data tiering, for access over the network by the Hyper-V hosts using Server Message Block (SMB) 3.0 protocol. 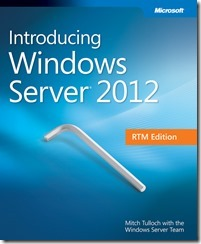 For more information on this kind of storage solution, download my free ebook Introducing Windows Server 2012 R2 Technical Overview (Microsoft Press, 2013) available in PDF, EPUB and MOBI format from the Microsoft Virtual Academy Free eBooks landing page. 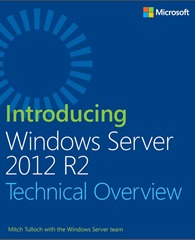 You may also want to download my earlier free ebook Introducing Windows Server 2012 (Microsoft Press, 2012). Additional information on the SoFS can be found on Microsoft TechNet.